Professor Anatoly Timofeevich Fomenko born in Donetzk, USSR in 1945. Full Member of the Russian Academy of Sci., Dr. of Sci. (Math. and Phys. ), Moscow State University (Moscow). 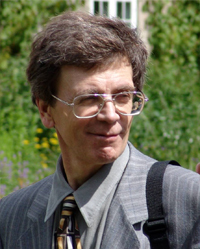 Head of the Department of Differential Geometry and Applications in Moscow University. He is a distinguished mathematician and a well-known specialist in the fields of geometry, Hamiltonian mechanics, calculus of variations, computer geometry and algorithmical problems in pattern recognition. He is a winner of the Award of the Moscow Math.Soc. (1974), the Award of the Presidium of USSR Acad.of Sci. in mathematics (1987) and the State Award of Russia (in mathematics) (1994). He has obtained fundamental results in the theory of minimal surfaces and solved the multidimensional Plateau's problem -the existence of globally minimal surface in each spectral bordisms class. He also created a theory of the topological classification of integrable Hamiltonian systems. This theory was applied to the important problem of classification of isoenergy surfaces for integrable dynamical systems (which arise for example in celestial mechanics and in the theory of the motion of rigid bodies). Fomenko obtained the complete classification of bifurcations of solutions of integrable Hamiltonian systems. He has also developed a new empirico-statistical methods for the analysis of narrative texts (e.g. chronicles). More about professor Fomenko and his C.V.
A.T.Fomenko also has a talent for expressing abstract mathematical concepts through artwork. Since the mid-1970s, Fomenko has created more than 280 graphic works. Not only have his images filled pages of some of his own books on geometry, but they have also been chosen to illustrate books on other subjects (including statistics, probability, number theory etc) by many other mathematicians. In addition, his works have found their way into the scientific and popular press and have been displayed in more than 100 exhibits in the Russia, USA, Canada, the Netherlands, India and much of Eastern Europe. Fomenko description of his technique probably sounds unlike anything that most of us have ever previously heard or learned about drawing. He never starts with rough sketches, copies, or outlines. Rather the final drawing appears all at once as a clean copy. "Each mark is final, and my hand does not return to it again". He compares his technique to the process of developing a photo "like using a rag to wipe a thick layer of dust from a picture that already exists". Professor Anatoly Fomenko does not have a personal web page, but if you google his name you will find much information about him and also more of his beautiful images.